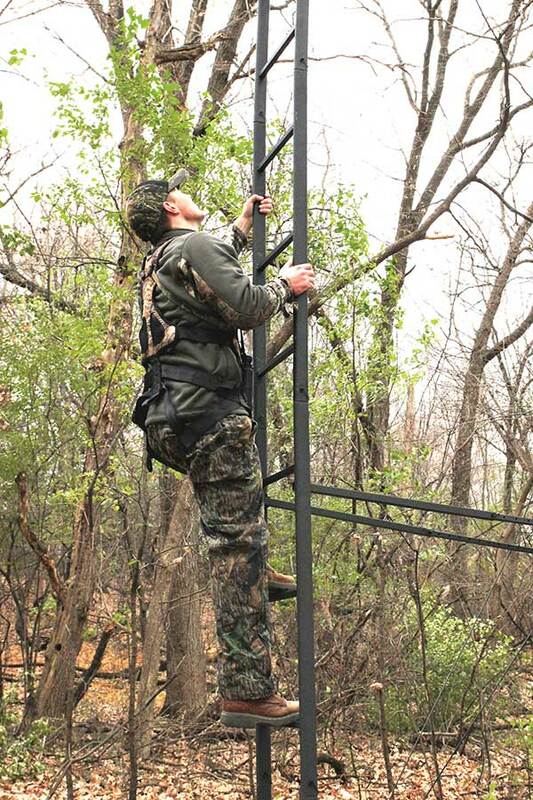 The Jayhawk is a 20′ two-man ladder stand featuring our revolutionary Safety System. Hunt at ease knowing that your stand is safe and secure before you leave the ground. Comfort-fleX mesh seat flips up and out of the way for full use of the platform. Padded armrest for added comfort and a footrest that flips back. Adjustable padded shooting rail can flip back or be removed. Stealth Silencers – self-lubricating nylon washers for no metal on metal contact, along with X-Force expanded metal for added strength, durability, traction and silencing. The Jayhawk also uses our HeliX oval tubing giving this stand extreme strength and sturdiness. Powder coated with our Weather Defender to protect against the elements and help eliminate sound. Comes standard with two complimentary drink holders and two accessory hooks. Learn more about the Jaw Safety System here.